Founded by Rawal Jaisal in 1156 A.D., Jaisalmer is situated deep in the heart of Thar Desert and abounds ancient palaces, temples and quaint settlements. As the sun sets, the sandstone buildings emit a lustrous glow, that make Jaisalmer the "Golden City". Airways : Jodhpur (285 km) is the nearest airport. Roadways : Regular bus services link Jaisalmer to Jodhpur, Ramdeora and Bikaner. Jaisalmer Fort is a magnificient monument in Jaisalmer. The Jaisalmer fort is the second oldest fort in Rajasthan after Chittorgarh. Jaisalmer fort is also known as the "Sonar Quila" or the Golden fort. This fort was built by the Bhatti Rajput chieftain Rawal Jaisal in 1156 AD, on the highest point of the Tricuta hill. The architecture of the Jaisalmer fort is exquisite. The ramparts, bastions and the long stretching walls of the fort dazzle gloriously during early morning and at the sunset. The fort is two hundred and fifty feet tall and reinforced by an imposing crenellated sandstone wall which is 30 feet high. The fort has 99 bastion, out of which 92 bastions were built between 1633 and 1647. The fort stands almost 30 metres over the city and about one fourth of the population of Jaisalmer lives within the huge ramparts of the fort. It is approached through Ganesh Pol, Suraj Pol, Bhoot Pol and Hawa Pol. The five storey fort adorns itself with balconies and windows that displays some of the finest masonry work, while the interior is painted and tiled in typical Rajput style. The bastions envelops a whole township that consist of palace complex, the havelis of rich merchants, several temples and the residential complexes of the armies and merchants. These merchants served and acquire a great deal of power and noble status in the royal courts of Bhatti Rajputs who founded the state in the 12th century and proceeded further. 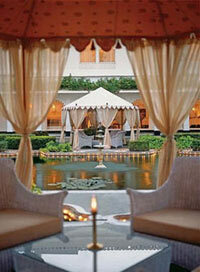 But the rich merchants inspired by the classic style of the royals, constructed huge mansions or havelis. These merchants engaged stone - craftsmen who worked delicately on the sandstone mansions. They filled up facades with sculptural figures, screen windows, delicate pavilions and beautiful balconies. The main attractions within the fort are a group of beautifully carved Jain temples built between the 12th and 15th century.